Inside Rupert Murdoch’s unlikely effort to make News Corp. totally green (Fox News included). Also from the Climate Desk: How to lose 300 million tons of CO2 in just 3 weeks! IN THE FOX NEWS universe, the world is definitely not warming. Quite the opposite: Climate change is “bunk,” a spectacular hoax perpetrated on the rest of us by a cabal of corrupt scientists. But while embracing climate skepticism may be good for ratings, the execs at Fox News’ parent company, News Corp., don’t see it as good for the long-term bottom line. By the end of this year, News Corp. aims to go carbon neutral—meaning that the home of über-global warming denialists like Sean Hannity and Glenn Beck may soon be one of the greenest multinational corporations around. Murdoch’s logic was that higher energy costs are inevitable, given coming carbon regulations and dwindling supplies of conventional fuels such as oil. So why not get ahead of the game? “Whatever [going carbon neutral] costs will be minimal compared to our overall revenues,” the media mogul has remarked, “and we’ll get that back many times over.” The company launched its mission by making a movie spin-off of Futurama its first carbon-neutral DVD release in 2007 (carbon savings: an estimated 447.5 metric tons), followed by the production of the seventh season of 24 (approximately 940 metric tons of CO2 saved). News Corp.’s plan, according to manager of energy initiatives Vijay Sudan, was to do the same for the rest of its operations by reducing energy use in its office facilities, moving to renewable energy, and purchasing offsets to take care of the remaining emissions. So far, so good. But going totally green turned out to be harder than it looked. That’s not because News Corp. is a massive emitter—apart from the hot air generated by Fox News, it produces 700,000 metric tons of carbon per year, mostly from printing newspapers, producing films, broadcasting television signals, and operating its 24-hour newsrooms. By comparison, a single coal plant releases millions of tons of emissions annually. But News Corp. is the second-largest media conglomerate in the world. Its hundreds of interests include film companies like 20th Century Fox, network and cable TV channels like Fox Broadcasting and National Geographic, newspapers like the New York Post and Wall Street Journal, Dow Jones Newswires, the HarperCollins publishing empire, billboards, a rugby league, MySpace, and those tiny machines that spit out coupons as you walk by the Frosted Flakes at the grocery store. So in November 2009, News Corp. turned to Hara, a software firm that helps companies evaluate what founder Amit Chatterjee calls their “organizational metabolism.” Companies can use the program to assess their resource use, emissions, and overall footprint; develop plans to shrink that footprint; and run cost-benefit analyses on various strategies to cut emissions. Want to cut solid waste? There’s an app for that. Want to determine the solar panel that’ll give you the best bang for your buck? There’s an app for that, too. The goal is to help businesses assess both the risks and the opportunities presented by their energy use. The global market for carbon-management software and services is expected to expand from $384 million in 2009 to more than $4.3 billion by 2017—an annual growth of 35 percent, according to Pike Research. Hara, whose customers include large, multinational companies like Coca-Cola and local governments such as the cities of Palo Alto and San Jose, California, thinks it can capture 80 percent of that market, says Chatterjee. The reason for the boom? The process that News Corp. embarked upon voluntarily—figuring out how it uses energy and how that will affect its financial health—will soon become compulsory for many businesses, as routine as filing taxes. Beginning this year, major emitters are required to report their CO2 output to the Environmental Protection Agency. The Securities and Exchange Commission is starting to require all public companies to disclose their climate risks, just as they would any other physical or fiscal liability. And with good reason: The biggest global warming impacts, like hurricane damage, real estate losses, and rising energy and water costs are expected to cost the economy almost $1.9 trillion annually by 2100. For businesses, the benefits of scrutinizing emissions aren’t purely environmental. Sudan says, “I would say our initiative overall has benefited the company financially.” Since Palo Alto began using Hara in 2009 to help it cut emissions by 15 percent over the next three years, the city has identified $2.2 million in budget savings. True, even if News Corp. manages to go entirely carbon neutral, the effect on global emissions will be small. But, Sudan says, consider the multiplier effect: News Corp.’s empire regularly reaches 1 billion sets of eyeballs. 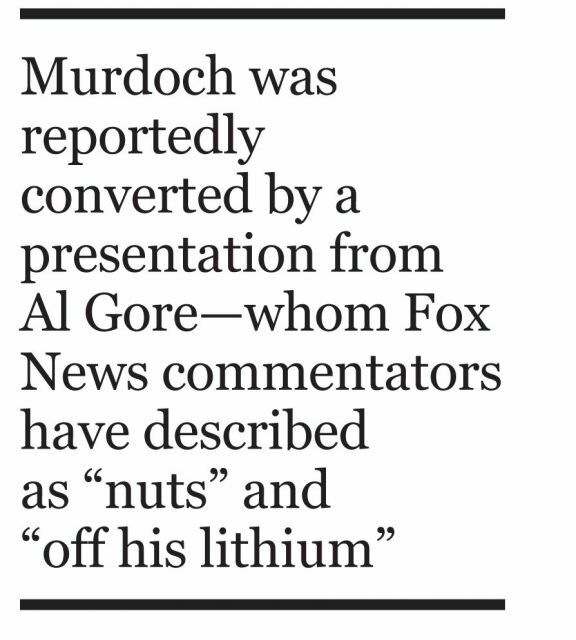 “Our audience’s carbon footprint is 10,000 times bigger than ours,” Murdoch has said. “That’s the carbon footprint we want to conquer.” To that end, News Corp. is exposing the thousands of employees at its various holdings to environmental education and encouraging subsidiaries to run public service announcements on global warming. It’s also considering weaving climate-related themes into its entertainment programs.